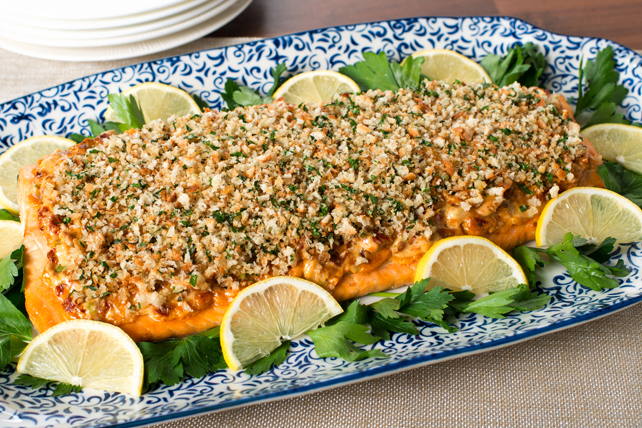 Salmon gets topped with a lemon and sun-dried tomato-flavoured mayonnaise and parsley-flecked bread crumbs in this wonderful baked recipe. Place fish, skin side down, on foil-covered baking sheet; season with pepper. Mix dressing, tomatoes, onions, lemon zest, mustard and garlic until blended; spread over fish. Combine remaining ingredients; sprinkle over fish. Press gently into dressing mixture to secure. Bake 25 to 30 min. or until fish flakes easily with fork and topping is golden brown. Garnish with lemon wedges and sprigs of additional fresh parsley before serving.